Nick I & ADD, Mozambique, 1740 S. Coast Hwy, 949 715-7777. The Good Foot, 9 p.m., Marine Room Tavern, 214 Ocean Ave.
Generation Idol, 8 p.m., The Coach House, 33157 Camino Capistrano, San Juan Capistrano, 949 496-8930. $15. Nick I Halloween bash, 7 p.m., Cliff Restaurant, 577 S. Coast Hwy. $5. Past Action Heroes and costume party, 9 p.m., Mozambique, 1740 S. Coast Hwy, 949 715-7777. $10. Robert Jon and the Wreck at a masquerade ball, 9 p.m., Marine Room Tavern, 214 Ocean Ave. $5. Oingo Boingo dance party, 8 p.m., The Coach House, 33157 Camino Capistrano, San Juan Capistrano, 949 496-8930. $25. Maureen O’Sullivan jazz quartet, 1 p.m.; Lesterfari & Kings, 5 p.m.; Mozambique, 1740 S. Coast Hwy, 949 715-7777. Missiles of October, 4 p.m., Marine Room Tavern, 214 Ocean Ave.
Danish String Quartet, 3 p.m., Irvine Barclay Theatre. 4242 Campus Dr.
Pianist Jean-Yves Thibaudet, 3 p.m., Soka University Performing Arts Center, Aliso Viejo. $49. (949) 480-4278. Original stories by Third Street Writers, 6 p.m., Laguna Public Library, 363 Glenneyre St. Free. Magnolia Memoir, 7 p.m., Mozambique, 1740 S. Coast Hwy. 949 715-7777. Poul Pederson, 7 p.m., Cliff Restaurant, 577 S. Coast Hwy. Locals Wednesday, Ocean Avenue Brewery, 237 Ocean Ave.
Bill Magee, 7 p.m., Mozambique, 1740 S. Coast Hwy., 949 715-7777. Kelly Fitzgerald, 7 p.m., Cliff Restaurant, 577 S. Coast Hwy. Art Walk, galleries stay open late. Free trolleys between Laguna Art Museum and Bluebird Canyon Drive. Nick I, 7 p.m., Cliff Restaurant, 577 S. Coast Hwy. Andrew Bloom, 7 p.m., Mozambique, 1740 S. Coast Hwy., 949 715-7777. Closing weekend. “I’m Still Getting My Act Together and Taking it On the Road,” 7:30 p.m., Laguna Playhouse, 606 Laguna Canyon Road. 949 497-2787. Through Nov. 1. David Ligare and Canyon Project exhibits, Laguna Art Museum, 307 Cliff Dr. Open daily except Wednesday. 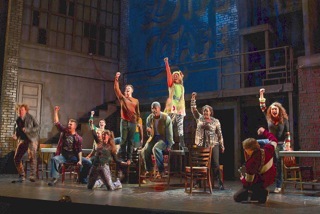 With themes about artists struggling for performance space, transgender relationships and AIDS, “Rent” retains its relevance in an ambitious production at La Mirada Theatre through Nov. 15. Tickets, $100-$300. 1-800-515-2171.Photo by Jason Niedle.